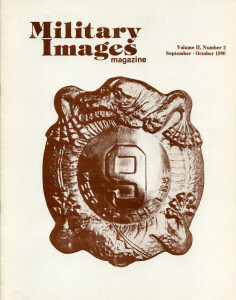 A close-up image of the belt buckle worn by the 9th U.S. Infantry, emblazoned with a Chinese dragon and the words “Keep up the Fire!” The buckle featured on the cover of Military Images is linked to the article beginning on page 26 of the current issue. A guest editorial in the form of a letter written by Roger L. DeMik of Tennessee offers insight on the connection between the understanding of the past and establishment of individual connections to history provided by photographic and future technologies. Letters include praise from readers in the Netherlands and South Africa, as well as from a collector’s group in California. One letter identified a few errors in a previous article on the “Bucktails” of Pennsylvania, as well as thanking the magazine for its series on naval uniforms, as it allowed the reader to identify the branch of service held by his great-grandfather and thereby getting a copy of his service records from the National Archives. The image of what appears to be a man wearing the Civil War uniform of a federal soldier in a quarter-plate tintype is actually the image of a Confederate from Missouri who was active in the Western theater of the war. Although not as renowned as a Mosby or Quantrill, it appears that Hildebrand’s Southern loyalty and wartime activity made it impossible for him to return to a peaceful life farming in the Midwest. He dictated his memoirs in 1870, as he was unable to read or write, and was eventually shot by a law officer in Illinois in 1872. The complete diary of Private Harold H. Wadleigh, a grenadier in the 353d Infantry Regiment, 89th Division of the American Expeditionary Forces in World War One is presented, beginning with his transport to France in May 1918 and ending with his unit crossing into German territory in December of that year. Some of the entries are short and to the point, while others provide description of the front lines, going “over the top” with his fellow soldiers, escorting a “shell shocked” comrade to an aid station, and how the soldiers in Wadleigh’s unit first received the news of the Armistice on November 11, 1918. In a relatively short space, this MI exclusive provides great insight on the front line experience of one American soldier from the “Middle West” Division. The magazine reviews Pickett’s Charge: A Microhistory of the Final Attack at Gettysburg, July 3, 1863 by George R. Stewart. The book is a reprint of the original 1959 work and goes into what the review calls “the author’s constant, sometimes painful, objectivity,” taking as many perspectives into account as possible and providing some very interesting pieces of information. The book is highly recommended. The article begins with a description of how daguerreotype images were made and then continues with descriptions of newer forms, such as the “hard images” or the ambrotype and tintype processes. These images had standard sizes, were usually placed in some sort of protective envelope or case, and poses were also generally very similar. Occasionally, the images were touched-up by hand, usually with rouge on cheeks and gilt paint on buttons and buckles. The images were negative images, however, and the subject would be seen in the reverse of how he or she would appear naturally; it was not possible to create copies of ambro- or tintypes. A process that used paper as a backing and provided negatives that could be duplicated allowed the advent of the carte de visite, as well as a means for the government to levy a tax. Virtually dying out by the end of the Civil War, the authors provide a few other examples of how photography was used in new and innovative ways. Seven different images illustrate the article, providing examples of what is discussed. The pictorial provides thirty images of U.S. Marines from between 1859 to about 1934. Many are cartes de visite of identified Maries, but others in the collection were images taken overseas at various duty stations, including in Peking. There are images of Marines in typical occupations, such as bandsmen and cooks, as well as standing at attention. Several Marines who received the Medal of Honor are included, as well as images of foreign Marines. This quotation, featured on the cover image of the belt buckle of the 9th U.S. Infantry, honors the final words of Colonel Emerson H. Linscum, who died rallying his troops on July 13, 1900, in during the Boxer Rebellion in Tientsin, China. After beginning his career with a three-month enlistment as a private with the 1st Vermont Volunteer Infantry at the start of the Civil War, Linscum became a career soldier. Returning to duty after serious injury in the Spanish-American War, Linscum was taking part in the international assault on the captured city when he fell. The 9th Infantry was authorized to use the belt buckle in 1923. A portrait of Col. Linscum accompanies the article, as well as three images taken outside of the Tientsin Gate. Images include the well-known, in the figure of William J. Hardee as Commandant of Cadets at West Point in the late 1850s, to the unknown, in an image of a young boy who resembles John Clem, the “Drummer Boy of Shiloh,” to a group of Ogalalla Sioux infantrymen from Fort Omaha. Unusual uniforms and insignia include a Bucktail wearing a musician’s frock coat, to an “officer of the day” wearing a Masonic tie pin, to a soldier from the Spanish-American War sporting his 7th Corps badge. Philippine Insurrection campaign veteran 1st Sgt. 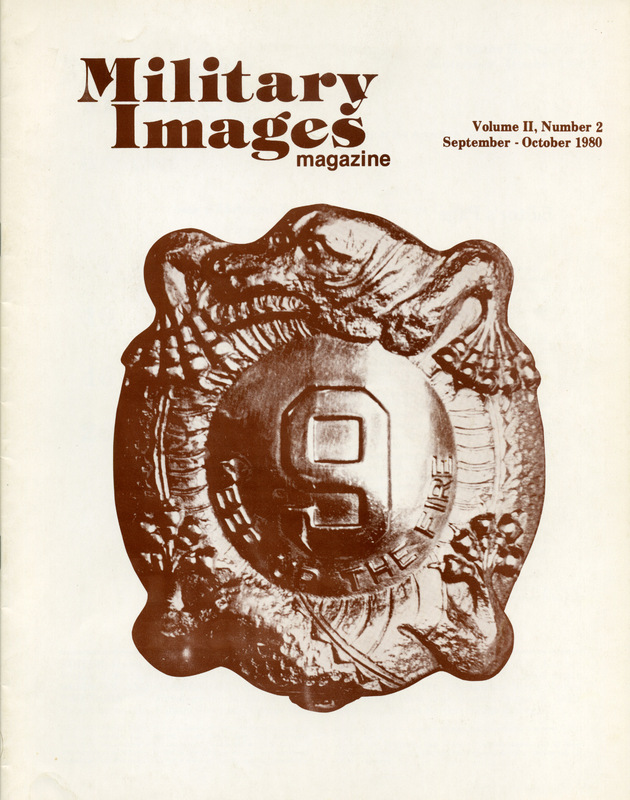 Amos Hay in his dress blue uniform graces the back of this MI issue in a crisp cabinet photograph image from about 1910.